On AW2015, Albion changed the formula of their famous, and the bestseller milk of Exage. SS2016, they also changed the formula of Exage White Milk too. 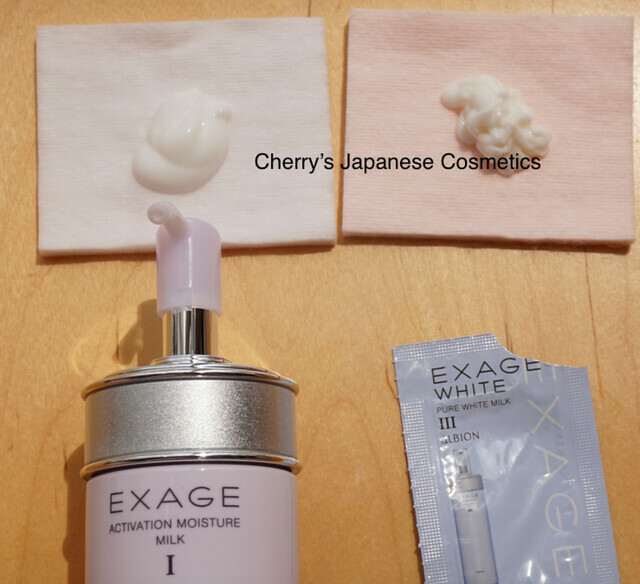 Newest are Exage Activation Moisture Milk and Exage White Pure White Milk. Japanese girls often change not only foundations but skin care items each seasons. Seems one of the BCs of Albion (she is the best BC ever met) choose “White” line for mid Summer only. I know you are from several places around the world, if you are from hotter place, I recommend to use “White” things longer than us, or whole a year. See also:How to choose Albion Exage, Infinesse and Excia AL? There are 3 types each. Exage is for “moisturize your skin”, and seems Albion is thinking #02 is the standard. So, they are setting switching Moisture Milk #02 to Pure White Milk #02. Both are “almost” the same perfume, why “almost”? both are stronger and I could not find any difference. My both of the sides afterward of applying them, I felt both are smoother, but Pure White Milk #2 is much smoother, I mean it is much lighter than #Activation Moisture Milk #2. I am so happy to get my skin better condition now (the previous few days), and I did not feel any sting by them. When my skin is so damaged, I get sting even by Excia AL. 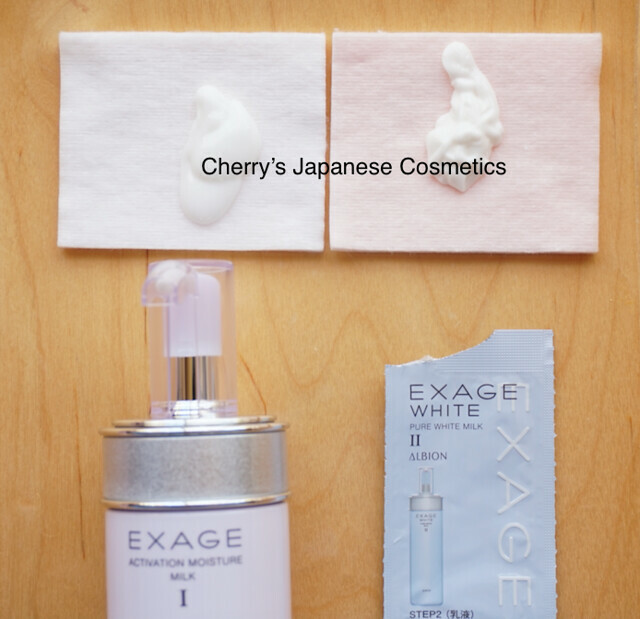 In Exage White, it has brightening effect, but I do not know whether it can interrupt tanning! I felt especially Pure White #2 is lighter, but I do not recommend Albion products if you are an oil prone. Because Pure White Milk #2 was much lighter than Moisture Milk #2, I got a sample of Pure White Milk #3, I compare Moisture Milk#2 and Pure White Milk #3. In this time, you may see Pure White Milk #3 looks harder than Moisture Milk #2. I guess it is actually not pretty much hard like it looks in this picture. Anyway, I applied both of my sides of my face. Both are smooth, but I felt Moisture Milk #02 is a little bit, just a little bit oilier than Pure White Milk #3, and Pure White Milk #3 is lighter, I felt. I had expected Pure White Milk #2 was much lighter than Moisture Milk #2, and Pure White Milk #3 could be even to Moisture Milk #2. No. Even Pure White Milk #3 is (a little bit) lighter than Moisture Milk #2. Recent of my preference, I like using lighter products a lot more than heavier products a little. Exage White is much near to my preference. I had thought both Exage White Pure White Milk #2 and #3 are lighter than Activation Milk #2. So, how they will be different with Activation Milk #1? Both of my face sides afterwards are smooth. But I felt Activation Moisture Milk #1 is a little bit, just a little bit lighter than Pure White Milk #3. I need to say again, even I felt Moisture Milk #1 is light, I do not recommend to use this products if you are an oil prone. Albion’s Milks are oily products. I felt Pure White Milk #3 is lighter than Moisture Milk #2, but a little bit heavier than Moisture Milk #1. So, I need compare Moisture Milk #1 and Pure White Milk #2. 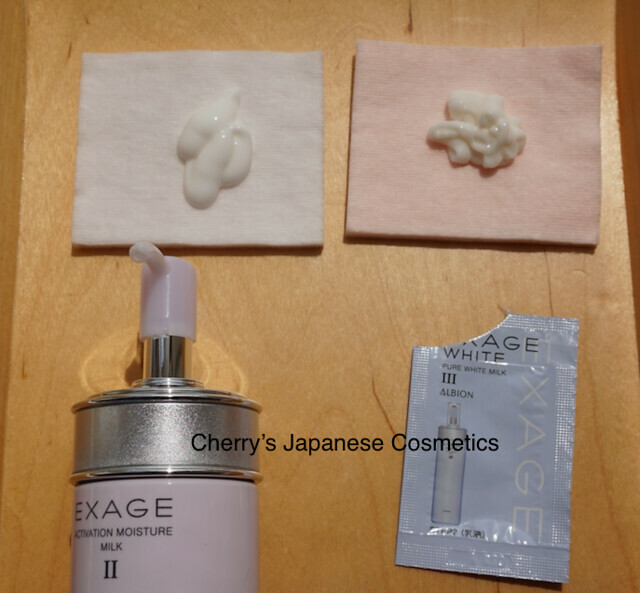 Probably I do not need to compare Exage Pure White Milk #1 and other. It may be much lighter than Moisture Milk #1.